The Westcliff is a charming luxury retreat with landscaped gardens and a Mediterranean village atmosphere, the perfect place from which to savour Johannesburg and to escape from it all. With its 9 villas, The Westcliff provides intimate settings which assure privacy and tranquillity, and superb comfort without the impersonality of large hotels. The rooms, of a minimum 47 sq metres, are individually designed and decorated with gorgeous features. Most have a private balcony overlooking the zoological gardens or one of the cobbled courtyards. Situated in an exclusive suburb of Johannesburg, The Westcliff enjoys spectacular views over the city. It offers a special Business Wing with all the facilities for an office away from the office, as well as complimentary shuttle service to local shopping centres, office parks and restaurants in the evenings. The Peech is Johannesburg's eco-friendly, chic boutique hotel. Centrally located in Melrose, between Rosebank and Sandton. King beds and spacious bathrooms with rain showers are some of the features of the stylish rooms and suites. Guests at the Peech Hotel can enjoy complimentary Wi-Fi and iPod sound systems. The Peech Hotel has a bistro restaurant with champagne bar. A Planet Fitness gym is adjacent to the hotel. A boardroom and events space is also available. An all-suite boutique hotel located close to the residential and commercial centers of Sandton and Rosebank, Ten Bompas Hotel has only 10 suites each with lounge and fireplace, bedroom with king size bed opening on to a terrace or private garden. The hotel's Local Grill on Bompas specializes in beef dishes and Sample Sides is a trendy restaurant, which serves sumptuous meals with wines from the hotel's cellar. The Mercure Johannesburg is a 3-star hotel in Randburg, ideally located next to the Brightwater Commons Shopping & Entertainment Centre. This neat hotel has 102 guest rooms spread over 3 floors. Each room is decorated in a classical style and features air conditioning as well as a modern bathroom. The Mercure Randburg serves a full buffet breakfast each morning. The hotel also has a bar. There are also many restaurants and food outlets for guests to choose from in the nearby shopping mall. The Mercure Johannesburg Randburg is approximately a 30-minute drive from OR Tambo International Airport. Central Johannesburg is 16 miles away. The Hilton Sandton features a fitness center and a swimming pool and is half a mile from the Sandton Convention Center. Guests can use the free shuttle to Nelson Mandela Square and the Sandton Gautrain Station The contemporary rooms feature garden or city views, with a complimentary newspaper. There is a tennis court as well as spa and sauna center. The staff can offer shuttle, tour, and ticket services. Breakfast is served each day in the pool gazebo. Guests can also dine at Tradewinds Restaurant or Lotus Teppanyaki and Sushi Bar, or enjoy a drink at Faces bar. Room service is available 24 hours. Activities in the area include the Apartheid Museum, Lion Park, and the Cradle of Humankind. The Hilton is in the central business district, 9 miles from the center of Johannesburg and 20 miles from OR Tambo International Airport. Located a 10 minutes' walk from Bright Water Commns Red Square, Coopers Croft B&B offers country-style accommodation with a homely feel. It features an outdoor pool, tennis court, Braai facilities and a garden. The bright and airy rooms are equipped with wooden décor and pastel coloured walls. Each room features a TV, fan and a private bathroom with free toiletries. A full English breakfast is included in the daily room rate. Guests can sunbathe poolside, enjoy a game of tennis or prepare a meal in the BBQ area. Indoors, guests can relax in the lounge area or play a game of table tennis. The staff at Coopers Croft B&B can help guests to organise a day excursion. Sandton city centre and Johannesburg are within a 20-minute drive away. O R Tambo International Airport is a 40-minute drive away by car. An airport shuttle is available upon request and free parking is available at the B&B. Surrounded by peach trees, this 3-star guesthouse offers an outdoor pool and a jacuzzi with picturesque views of the garden. It is a 5-minute drive from Johannesburg city centre. Some rooms are decorated in the style of an English country house with local South African touches. A kitchen with refrigerator and coffee maker are featured in several rooms. After a healthy work-out at Greenwood’s exercise room, guests can have a drink at the relaxed bar. Breakfast is served in the guesthouse’s cosy restaurant. Nearby attractions include Cresta Shopping centre, Delta Park, and the Emmarentia Dam. Greenwood Manor’s staff can arrange transportation to and from the airports of O.R. Tambo and Lanseria. Set in a quiet tree-lined street of Essexwold, only a short drive from OR Tambo International Airport, this charming bed and breakfast provides guests with comfortable lodging. Easily accessible via a number of highways, Liongate Bed & Breakfast is the ideal retreat for tourists and business travelers alike. Relax after a long day at work or sightseeing, in the comfort of your well-furnished bedroom. The attentive staff is happy to help you arrange a special tour. Start your day with a full English breakfast or opt for the Continental version. During your stay you can make use of the tennis court or go for a swim in the outdoor pool. Several shopping centers, restaurants, movie theaters and fitness facilities are nearby. In the evening, let the day draw to an end with a drink from the bar. Within the grounds of Wanderers Club, this 4-star hotel offers well-furnished rooms with a flat-screen satellite TV. Protea provides an outdoor pool and access to the Wanderers Club’s facilities. Leading out onto the pool deck, Big Apple Restaurant serves a rich breakfast buffet daily. In the evening, specialties including mixed grill and smoked salmon, are available. A 24-hour coffee and cocktail bar is on site. Protea Hotel has an in-house gym. Guests can also work out at Planet Fitness at the Wanderers Club. The club includes a beauty salon, golf course, and a tennis court. Younger guests can join the Kid's Club. The M1 Freeway is just a 5-minute drive away, providing access to business centers, the OR Tambo International Airport, and the rest of Johannesburg. Free parking is available at Protea Hotel Wanderers. Located in Randburg, near Alberts Farm Conservancy and Sandton City, this hotel is designed like a Tuscan villa and delights guests with quality service and accommodation. Only a short drive from Johannesburg, Benvenuto radiates a warm atmosphere. Soak up the sun in the beautifully landscaped garden or enjoy a swim in the pool. If you prefer, you can also check your emails via free wireless internet. Benvenuto features a number of meeting rooms seating between 6 and 100 guests. Treat yourself to a delicious meal at the restaurant after attending a conference. For just that little extra comfort, all of the guest rooms include extra-long beds and dimmable lights. Located in the heart of vibrant Melville, just one minute away from 7th Street, this lovely old house is the perfect escape in the buzzing city of Johannesburg. With beautiful hardwood floors, pressed ceilings and tastefully decorated rooms, this guest house offers both comfort and good taste. Whether you are on vacation or on a business trip, the friendly staff and cozy rooms are sure to make you feel at home. Step out of the front door and discover the many sights this amazing city has to offer. Not only are museums, shopping malls and restaurants just a short walk away, a number of parks are just around the corner, ideal for jogging or enjoying a picnic. Offering a peaceful setting and great service, right in the heart of the popular bohemian Melville, Life on 3rd provides accommodations that include continental breakfast. There are 5 different room types that are all decorated in warm, earth tones and contain high quality bedding, satellite TV, ceiling fan, and Wi-Fi internet access. Some rooms feature private entrances, electric blankets, and dressing tables A warm, 3-course breakfast is served every morning in the contemporary dining room. Guests can sunbathe and enjoy the welcome retreat of the wooden deck, from the busy city. The friendly staff gladly assists guests with arrangements to explore Melville’s popular street life, plan day tours, make restaurant reservations, or transportation to and from the airport. Life on 3rd is close to the Johannesburg city business district and Johannesburg Botanical Gardens. It is also within driving distance of various shopping malls and The Apartheid Museum. This peaceful hotel offers stylish accommodations in Johannesburg’s suburb of Sandton. It features 2 swimming pools set within grounds, as well as 2 gourmet restaurants and a modern fitness center. Protea Hotel Balalaika offers a free luxury shuttle service to and from Sandton Gautrain Station, which has a direct line to O.R Tambo International Airport, 12 miles away. All guest rooms at Protea Hotel Balalaika Sandton are decorated in English country style, featuring bright colors and large windows. The private bathrooms come with complimentary deluxe bath products. Breakfast is served in The Colony Restaurant which has a terrace, and The Bull Run specializes in prime cuts of South African beef. There are several bars and lounges, including Lords Cigar Bar and The Oval Coffee Shop. The Sandton City shopping center is 660 yards from the hotel, and Nelson Mandela Square and Sandton Convention Centre are both half a mile away. On-site parking is available. This modern 4-star hotel in Rosebank has an outdoor pool and a zen garden. It is a short walk from the African Craft Market, featuring diverse shopping and dining options. The air-conditioned rooms at the Crowne Plaza Johannesburg come equipped with iPod docking stations, Wi-Fi, and Sony Bravia LCD TV with DSTV channels. Hotel food and beverage options include the award winning Butcher Block Restaurant, the informal Fresh Restaurant, the Rosebank Café and the Circle cocktail bar. Additional hotel facilities include an outdoor swimming pool, Techno Gym, spa and a state of the art business center. 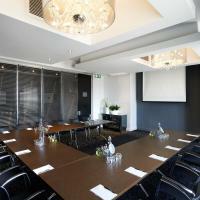 Crowne Plaza Johannesburg - The Rosebank is a 30 minute drive from O.R.Tambo International Airport. Rosebank Gautrain Station is within walking distance of the hotel. Ashanti Hotel is situated in the heart of the financial and banking district of Johannesburg, in a Neoclassical, brownstone-and-marble building that is becoming a landmark of the city’s regeneration. Fully restored and refurbished, its studios and 1/2 bedroom apartments present guests with designer features, spacious accommodations and all conveniences for working on the go. For the business traveler, the Ashanti offers easy access to the center of Sandton and a business center that comprises of equipped boardrooms, serviced offices and a lecture room. For rest and relaxation, guests can enjoy a 'chill zone', the rooftop swimming pool, as well as Ashanti's African cuisine restaurant. In addition, many of Johannesburg’s shops, bars and entertainment venues are close by. Splice is designed to accommodate guests in luxurious modern one and two bedroom apartments that feature plasma screen TVs with satellite channels, private bathrooms and fully equipped kitchens. . Other unique features include a glass-walled heated swimming pool and a 7-story atrium. Splice is situated close to Killarney Mall, Rosebank, Houghton and Hyde Park. Set in a villa within landscaped grounds, 10 2nd Avenue Houghton Estate offers elegant rooms with balconies and free Wi-Fi. It also includes an outdoor swimming pool with cocktail bar. All rooms have satellite TV, personalized telephone number, and robes and slippers. A complimentary soft-drink minibar and hot drink facility is available. All guests are welcomed with a drink and upon arrival. Houghton Estate serves a full English breakfast with Champagne daily. The hotel restaurant offers modern cuisine and special diets meals prepared with organic ingredients. Guests can enjoy a pre-dinner drink in the cozy wine cellar bar. The 2nd Avenue Houghton offers guests the usage of a room which seats 5 guests. With a fireplace, it is a pleasant place for private meetings and dinners. 10 2nd Avenue Houghton Estate is just over 2 miles from Johannesburg Zoo. The center of Johannesburg, which features sights including the Sci-Bono Discovery Center and Museum Africa, is 10 minutes’ away by car. This design hotel offers well-equipped apartments with fully fitted kitchens in the busy northern suburb of Bedfordview, only a 10 minute drive from the international airport. The Nicol has everything you need for a comfortable business trip or South African vacation, including meeting facilities and secure basement parking. Important financial centers, such as the center of Johannesburg and Sandton, are only a 15-20 minute drive away, and guests have easy access to several major national motorways. The hotel has 24-hour security surveillance and the apartments are all accessed with a fingerprint-recognition system. Situated in Parktown, the Sunnyside Park Hotel is a 4-star hotel offering stylish accommodation, fantastic service and beautiful, green surroundings. There is free private parking and a free shuttle bus. All rooms and suites are elegantly furnished, each with satellite TV. Every room has a luxury bathroom, and many overlook the hotel’s gardens. Guests at Sunnyside can enjoy the outdoor swimming pool and fitness center. There is a garden and spacious terrace. The hotel’s popular restaurant is open daily and serves a range of international cuisine. There is a traditional South African braii held every Thursday. Sunnyside has an English pub, which often features live entertainment. Sunnyside Park Hotel is within easy reach of the University of the Witwatersrand, The Wild’s Nature Reserve and Johannesburg Zoo. Guests can take the free shuttle bus to Killarney Shopping Mall. Only 4 miles from Sandton's center, this modern hotel features great service and accommodations in an ideal location for visiting Sandton, Bryanston, and Johannesburg's business areas. The Holiday Inn Express Woodmead provide smoking and non-smoking rooms that include large terraces, cable/satellite TV and work desks. Free continental breakfast is served in the Holiday Inn’s Great Room. Butcherblock Restaurant next to the hotel offers an intimate and relaxing dining experience and a number of restaurants can be found within 2.5 miles of the property. Drinks are served at the Lobby Bar or on the balcony. Holiday Inn Express is not far from Johannesburg's OR Tambo International Airport. Guests can also easily reach many shops, bars, restaurants and theaters at the nearby city of Sandton. Westpoint Executive Suites is situated at the heart of Johannesburg's business and financial center, a short walk away from SandtonCity. It offers excellent self-catering accommodation. Westpoint Executive Suites is a modern, high-rise building with luxury apartments decorated in a very elegant style. All apartments are well-equipped, offering every comfort you need. Sandton City, the Sandton Convention Centre and Nelson Mandela Square can be reached in just a 10 minute walk. OR Tambo International Airport is a 20-minute drive away. Spacious gardens and a semi-Olympic sized swimming pool are available for guests, along with wooden deck chairs with cushions and large sun umbrellas around at the pool area. Gas barbeque facilities are also provided, as are 2 parking spaces per apartment. Located north of Johannesburg, in the suburb of Rivonia, this guesthouse is set in a large private garden and offers a tranquil retreat in the heart of Sandton. Easily reachable from the highway, Rivonia Bed & Breakfast is in a secure area of the Rivonia Valley and radiates a welcoming atmosphere. Start the day with a swim in the outdoor pool. While you dry in the sun, your children can explore the garden and play in the treehouse. For those looking to explore the region, the attentive staff is happy to arrange a rental car. Pay a visit to the nearby golf course or the Rivonia Shopping Centre. Upon your return, you can contact friends and family via wireless internet or prepare dinner on the barbecue. Offering comfortable guest rooms with private garden and free parking, this bed and breakfast is located in the suburb of Melville. Not far from the bustling center of Johannesburg, Die Agterplaas B&B provides you with a convenient and comfortable base. Wake up each morning at Die Agterplaas with a free full English breakfast in the characteristic dining room. Dinner can be arranged on request. Experience genuine South African hospitality at its best at Die Agterplaas B&B. Badia's Coffee Shop provides a warm atmosphere for a light snack or cup of tea. The garden is a wonderful place to relax with a refreshing free drink from your room and read the newspaper. The Indaba Hotel and Conference Centre is a 4-star hotel located just north of the business and commercial district of Sandton. The hotel features a total of 260 comfortable and neatly decorated guest accommodations. The rooms are located in smaller accommodation blocks, scattered around the hotel’s pretty landscaped gardens and grounds. Guests of the Indaba Hotel will appreciate the recreational facilities that are offered. These include a couple of swimming pools, tennis courts, a gym and an in-house spa. Guests can also enjoy scenic walks around the hotel’s beautiful gardens. The hotel’s on-site restaurants and bars serve a great range of international cuisine. The Chief’s Boma Restaurant is the perfect venue to enjoy traditional South African cooking, alongside live Marimba band performances. The Indaba Hotel & Conference Centre offers a shuttle service to the Fourways Shopping Mall and the Montecasino. This newly built Radisson Blu Hotel occupies a prime location in the heart of Sandton's business district. Its impressive atrium sets the tone for a memorable experience. 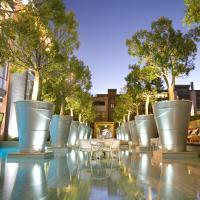 Radisson Blu Hotel Sandton features 53,819 sq ft of spa and fitness facilities. They include an 8th-floor swimming pool with sun deck and views of the city skyline, a state-of-the-art gym and an indoor/outdoor jogging track. At the hotel's Italian restaurant, meals are prepared in front of you in the show kitchen. 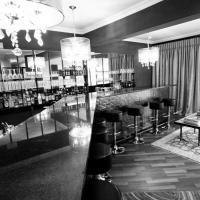 There is also a private dining room, a cafe serving healthy drinks and snacks and the stylishly decorated Bar & Lounge. Radisson Blu Hotel Sandton is within walking distance of the Johannesburg Stock Exchange, Sandton Convention Centre and the Village Walk Shopping Complex. OR Tambo International Airport is 18.6 miles away. Sandton Lodge offers free Wi-Fi and free parking. It is located in Rivonia, 10 minutes from Woodmead and Sandton City. The hotel offers a swimming pool, terrace, and garden. The suites at Sandton Lodge include fully-equipped kitchens. The hotel also has a restaurant and bar. Local attractions include The Boulevard and Rivonia Square, where guests can find shops, restaurants and bars. Guests can visit the famous Browns Restaurant, which boasts fine wine cellars and private gardens. Sandton Lodge Rivonia is a 20-minute drive from Johannesburg International Airport. 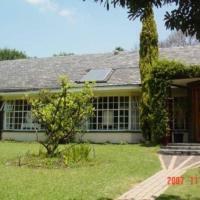 Set in the green Linden suburb, this family-run bed and breakfast is surrounded by Emmarentia Dam and Delta Park. The individually decorated rooms offer free Wi-Fi and warm, African decor. Easily accessible via highway M1, Cherry Tree Cottage provides free, secure parking. Shuttle services to Gautrain Train Station can be arranged, where guests can take a train to OR Tambo International Airport. Each of the comfortable suites enjoys quiet grounds setting and a private entrance. The bright rooms are equipped with a tea/coffee maker and a work desk. A freshly prepared continental breakfast is served daily in the dining room. Guests can relax on their private patio overlooking the grounds and enjoy a traditional braai in the evening. Randpark and Parkview Golf Courses are within 2 miles of Cherry Tree. Several shopping malls and restaurants are also within walking distance. Tucked away in the outskirts of Greater Johannesburg, this manor enjoys a tranquil location in Chartwell West and impresses with its stunning garden and charming suites and cottages. Just a short drive from Diepsloot Nature Reserve, Chartwell Castle & Guest House is home to the Southern Hemispheres biggest hedgerow maze. Guests can enjoy a refreshing swim in the outdoor pool. Chartwell Castle includes only a small number of suites and cottages, ensuring an intimate atmosphere. Modern décor and earthy tones further complement each of the guest units. Next to airport transfers, room service and barbecue facilities, Chartwell also offers free internet access. Set in a private garden, Strathavon Bed and Breakfast offers individually decorated accommodation with a TV and a private bathroom. It features a modern poolside terrace and a lounge area. Sandton is a 5-minute drive away. The rooms and self-catering cottage are equipped with wooden furnishings. Each room type has a TV, fan, kettle and a private bathroom. Some rooms have views of the garden and pool. Guests can sunbathe in the garden on the sun loungers, or have a swim in the pool. Indoors, guests can relax in the living room and make use of the free Wi-Fi throughout the B&B. Strathavon has a modern, fully-equipped kitchen for guests use. Breakfast is served daily in the breakfast room overlooking the pool. Houghton Golf Club, Nelson Mandela Square and Johannesburg city centre are within a 20-minute drive away. Free parking is available on site. OR Tambo International Airport is just a 30-minute drive from away. Gautrain Sandton Station is 3 km away. This guesthouse is located in the historic town of Melville, close to Johannesburg and central Rosebank. Local tourist attractions include Rosebank Craft Market, Melville Koppies, Emmerentia Park and Zoo Lake. Melville Manor is situated within walking distance of the shopping mall. Choose between enjoying a drink at the hotel or down the road at one of the popular bars, restaurants and nightclubs. Start your day by relaxing on the patio with a cup of tea or coffee after breakfast. Spread over 2 acres of lush garden, this lodge is located in the heart of Sandton and combines the benefits of a hotel with the intimacy of a guest house. Offering everything - from a balloon ride to a day on the golf course, Tladi Lodge is a luxurious retreat for all guests. Spend the day playing tennis, visiting a nearby diamond mine or simply soaking up the sun next to the large outdoor pool. Traditional aspects such as thatched roofing and African artworks underline Tladi's comfortable feel. Relax in your spacious room or enjoy a hot bath in your free-standing tub. Guests looking to stay in contact with the outside world can read a newspaper. Tladi Lodge also has a bar, perfect for having a nightcap after a day of sightseeing or traveling. In Mulbarton, a scenic suburb of Johannesburg, this exclusive guesthouse impresses with its Mediterranean-style décor and luxurious rooms. Only 20 minutes from OR Tambo International Airport, Villa Lugano Guesthouse is a lavish retreat. Spend the day relaxing next to the pool, sunbathing on the grounds and working out at the gym. All rooms feature a distinct light interior with chic, elegant furnishings and colonial-style fittings. The Italian towns of Lugano and Portofino are the main influence for the style of the rooms. 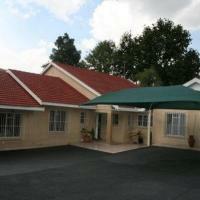 Villa Lugano Guesthouse is close to the shopping centers, The Glen and Glenvista Shopping Mall. Glenvista Country Club is one mile away. Located in the tranquil up-market residential suburb of Bedfordview, Johannesburg, The Munday Bed & Breakfast offers a home from home in central location with easy access to major highways. Feel at home in the large, stylish, air conditioned guest houses or self-catering apartments with furnishings that are adaptable to your needs. All living units contain modern facilities, including Internet access, flat screen TVs, and barbecue on enclosed porch with beautiful views of the Gillooly's Mountain. Free on-site parking is available and packed lunches can be arranged upon request at the guesthouse. 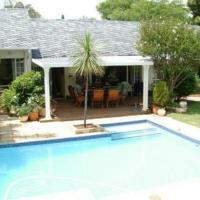 Munday Guest House can also arrange tours to Johannesburg's main attractions. The guesthouse is a 10-minute drive from the O.R. Tambo International Airport. The Gillooly's confenrence center and driving range, dogs kennel and picnic area are a 10-minute walk away. The Eastgate Shopping Center and the Bedford Center Shopping Center are less than one mile away. This cozy 3-star guesthouse is 5 minutes from the main north and south freeways leading to Pretoria, Sandton and Johannesburg International Airport. 33 on First Guesthouse provides a home-away-from-home accommodations, with convenient rooms that are individually decorated to reflect the local culture. 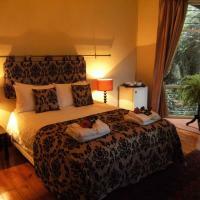 All rooms ensure privacy and contain tea/coffee making facilities, DSTV and private bathrooms. Guests can enjoy fresh breakfast served every morning including weekends and public holidays. Wi-Fi is available and there is a lobby computer provided for all guests. 33 on First is ideally located close to Campus Square Shopping center as well 7th street with its famous local restaurants. Other nearby attractions include Sunday market at the Rosebank Mall, Mandela Bridge, Johannesburg Art Gallery, and Auckland Park. 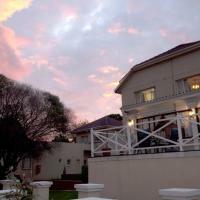 Villa Vittoria Guest House is located in Hyde Park. It has an outdoor swimming pool surrounded by landscaped grounds. Free private parking is available. The air conditioned rooms at the Villa Vittoria Guest House have a spacious balcony, a work desk and a minibar. Some rooms have a kitchen with a microwave and refrigerator. The Vittoria Guest House also has a terrace where guests can enjoy drinks. Barbecue facilities are also available. Villa Vittoria Guest House is within walking distance of the wanderer's Cricket stadium, and a 5-minute drive from both the Rosebank and Sandton Gau train Stations. Flamboyant Guest Lodge offers comfortable accommodations and great facilities in Johannesburg's major destinations. Each room is tastefully decorated and contain a separate bathroom, a private patio, tea/coffee facilities, and free Wi-Fi internet access. The property is secured 24/7 with Wi-Fi is accessible throughout. There is a flood-lit tennis court, swimming pool, and well-maintained gardens. Guests can also make use of the private patio, DSTV, and airport pick up and drop service. Flamboyant Guest Lodge is close to all amenities for your convenience, and is a mere 10 minute ride from Sandton City Centre and Melrose Arch Shopping Mall. Village Green Guest House offers free Wi-Fi, secluded, cozy accommodation in the heart of Parkview suburb, in Johannesburg. Surrounded by lush, green gardens, Village Green provide large suites with private bathrooms and private access to the pool and garden. All living units contain extra long beds, satellite TV, DVD player, and complimentary tea and coffee, refreshments in mini-fridges, Guests can relax in a secure environment or swim in the inviting outdoor garden pool. Freshly prepared breakfast is served daily at the restaurant. There is secure off street parking facilities. Guests can easily reach the nearby shopping area or enjoy dining options of Parkview. Genesis is a 4-star hotel and conference center located within easy reach of Johannesburg’s central business district, offering free parking and an outdoor swimming pool. All rooms at Genesis Suites and Conferencing are equipped with LCD TVs with satellite channels and DVD players. Every room has a well-lit work desk and a private bathroom with a hairdryer. Fairmont Grill is open for breakfast, lunch and dinner, and BarSushi serves fresh sushi in stylish surroundings. All suites have self-catering facilities including a microwave and a refrigerator. There is an outdoor swimming pool with a sun deck and conferencing for up to 120 attendees can be accommodated. 2 golf courses are available within 2 miles of the hotel. Genesis Suites and Conferencing is 9 miles from O.R. Tambo Airport. A shuttle service is available upon request. Situated close to the centre of Sandton, Johannesburg, this 4-star guest house offers simply decorated rooms with free Wi-Fi. It features an outdoor pool and free private parking. Shaka Guest House’s air-conditioned rooms are decorated with traditional furniture in neutral tones. Each room has a satellite TV, a tea/coffee maker, and a private bathroom with bath or shower. Guests can relax in outdoor swimming pool surrounded by a garden, while younger guests can have fun in the children's playground. Just a 5-minute drive away from Sandton Convention Centre, this property is nearby a selection of restaurants and shops. Johannesburg-Grand Central Airport is 13 km, while OR Tambo International Airport is 18 km away. Transportation to and from the airport and the surrounding areas is also available. In the center of Johannesburg, this designer hotel offers luxury accommodations, a 2 minute drive from Highway M1. It has a large outdoor pool, and offers a free shuttle to the Sandton Gautrain Station. 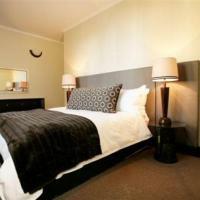 Guest rooms at the Protea Hotel Fire & Ice! 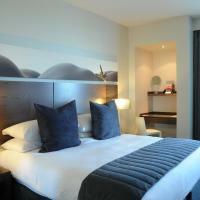 Melrose Arch feature luxury bedding and floor-to-ceiling windows. All rooms have an LCD TV, a lap-top size safe, and tea and coffee making facilities. The in-house restaurant serves breakfast, lunch and dinner daily as well as High Tea on Sundays. Protea’s elegant bar serves signature cocktails and milkshakes in an energetic and lively setting. The hotel's Lobby Lounge is located nearby. Rosebank Mall is only 2 miles from Protea Hotel Fire! & Ice Melrose Arch. Wanderers Golf Club is less than one mile away. This 4-star hotel is offers free Wi-Fi and modern apartment accommodation in the center of Johannesburg's inner city financial and business district. It is close to Ellis Park and Johannesburg stadiums. Mapungubwe Hotel Apartments provides spacious studios and apartments that include LCD TVS and large seating areas. The hotel features a centrally situated, outdoor pool that is surrounded by the hotel and includes a sun deck and seating areas. Mapungubwe’s restaurant and bar serves buffet breakfast, lunch, dinner along with a variety of drinks. Situated in Craighall, the Hands On Retreat offers expansive grounds, massage and spa facilities and free Wi-Fi throughout. It is close to Rosebank, Sandton and Hyde Park corner shopping center. All rooms have a grounds entrance and a small kitchenette for self catering purposes. Free parking available on site. English breakfast is served every morning in the Hands On’s dining room. Refreshments are served on the outdoor porch. Lourie Lodge is located just 20 minutes from Sandton. Fourways Mall and Montecasino are nearby. Guests can enjoy an honor bar and free Wi-Fi. An airport shuttle operates on request. Rooms are spacious and contemporary in style. With rooms overlook the lodge garden and have Wi-Fi access and TVs. Guests can enjoy the Lourie Lodge tennis courts, or can relax in the outdoor swimming pool. Hot cooked-to-order breakfasts are served every morning. 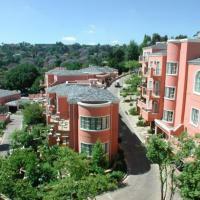 Located in trendy Upper Houghton, this 4-star hotel offers luxurious accommodation alongside free Wi-Fi access. St Peter's Place Boutique Hotel is a drive away from Rosebank, Sandton and Midrand. All rooms at this boutique hotel are spacious and set in elegant, comfortable furnishings. Each one has air conditioning, satellite TV as well as a digital safe. St Peter's Place Boutique Hotel features a pool area, complete with lounge chairs and shaded seating. Other facilities at the hotel include free parking. The hotel is within driving distance to popular attractions such as the Houghton Golf Course and Constitution Hill. It is a 20 minute drive to OR Tambo International Airport. Thatchfoord Lodge is situated in Sandton and is just under 30 minutes by car from Johannesburg. It features an outdoor swimming pool and terrace with views of the Sand River. This intimate lodge serves a full English breakfast daily. Thatchfoord also offers a range of tour service to nearby nature reserves and parks on request. Free private parking is available on site and free Wi-Fi is available throughout the hotel.